You know, after spending so much time researching Max Stark’s holdings I almost feel like I know him. I was after all once a close neighbor of his delightful hotel. I can assure you, dear readers, it was an experience I will cherish for many years to come. And on that note I have a very exciting piece of news to relay. Soon many more of my fellow Greenpointers will have the pleasure of calling Max a neighbor! 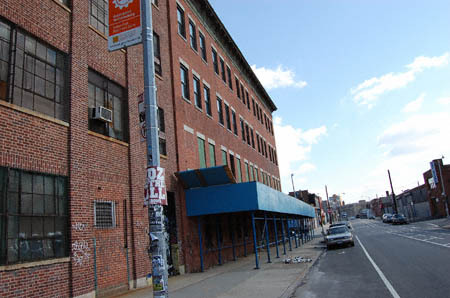 i am particularly interested in their plan to turn this building into a transient hotel, which was disapproved by the DOB in 2006. considering that they already own one, the good old greenpoint hotel. While spot-on regarding the Rocket Factory and 467 Troutman Street, my buddy is dead wrong about the Department of Building’s kiboshing Max’s plans to convert this building into a hotel. Plans to convert this building into (and I quote) “transient hotel” were green lighted by the Department of Buildings last week. But don’t take my word for it. Click here and read for yourself! Wow. First it was an illegal rooftop garden at Studio B and now there will be a hotel just down the block! Given how much value Mr. Stark’s other hotel has added to the Garden Spot, I can hardly wait to see how this, his latest venture into the hospitality industry, will pan out. P.S. : Big props go out to Neighborhood Threat for tipping me off to this. Thanks! So is this going to be a bona fide hotel or an SRO? Thoughts of huge SRO on Banker give me a queasy feeling. There’s a CB1 meeting tonight at 6:30 at 211 Ainslie, if anyone wants to go. I’m going to try and go to talk about Studio B issues. Maybe this should be added to the list of things to discuss? I find everything about 80 Clay St. this very interesting. My brother lives in one of his buildings in Brownsville, 351 Howard Ave. in Brooklyn to be exact. Mind you, this building has been mismanaged in the past, with no repairs being done, boiler not working, the usual complaints for a building being neglected, or should I say, being run by slumlords whose only interest in obtaining these buildings is to get richer and richer while the poor residents suffer unnecessarily. Well, I did some research, and guess what? Mr. Max Stark has taken this building over! Judging by what I’ve read about the Greenpoint Hotel, now I see why the tenants at 351 Howard ave. are living worse than before, not to mention the fact that there are several HP cases in Civil Court against them. By the way, they are known as 351 Enterprise LLC now, led by Mr. Stark.